This is MY kind of egg sandwich! 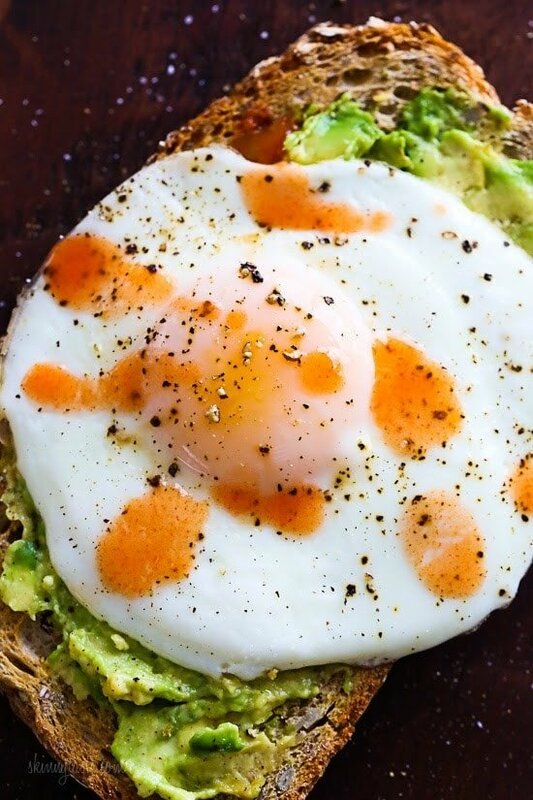 Whole grain toast with mashed avocado, a runny egg and a few dashes of hot sauce – only 5 ingredients, 5 minutes to make, doesn’t get better than that! I’m not much of a breakfast person, most mornings I usually grab a cup of coffee, a hard boiled egg and a piece of fruit, or whip up a smoothie. But lately, I’ve been obsessed with avocado toast for breakfast, especially when I have avocados in my fridge that need to be used up. It’s a simple, healthy breakfast when you need something delicious and fast. To store unused ½ of avocado, wrap tightly with plastic wrap and place in refrigerator. Leave the pit in and get the wrap as close to the surface of the fruit as possible. If browning occurs, gently scrape the exposed flesh with a butter knife and voila, beautiful green avocado lies within! If you’re in a hurry, you can swap a pre-boiled egg for the sunny side up one. Mash the avocado in a small bowl and season with salt and pepper. Heat a small nonstick skillet over low heat, spray with oil and gently crack the egg into the skillet. Cover and cook to your liking. This looks so good! What bread do you like/use? When I have no time to cook an egg, I mix I/4 to 1/2 medium avocado with an Instant Pot hard boiled egg and put it on Trader Joe’s Sprouted toast. It’s egg salad without the mayo. I use Jane’s crazy salt, or TJ’s Everything but the Bagel salt. What about browning slices of Avacado using olive oil. Scramble the eggs then stuff them in a hot biscuit. Top it off with a slice or two of the fried Avocado and s slice of cheese if that is your thing.Since I do not eat anything that is not cooked especially runny egg yolks this seems like it would be tastier than half cooked eggs on toast..
Love Slap your Mama Cajun seasoning…the white pepper! My husband is half Cajun! I actually carry a zip lock baggie of it when we eat out!! I made this today and it was delicious! Instead of hot sauce I used trader joes’s Everything bagel seasoning. It’s so good on eggs! Rub a garlic clove on your bread after toasting it. Its life changing! I don’t eat eggs but started working out and knew pancakes and French toast were not a good idea. Gave it a shot and is was delicious to say the least! I even tried hot sauce for the first time! This is amazing! My 15-year-old daughter and I both loved it. We used a homemade guacamole instead of just the avocado because we had just made some over the weekend. The added onion, tomato, and jalapeno are great. I’m sure it’d be good with just avocado, which we’ll experience after the quac is gone! 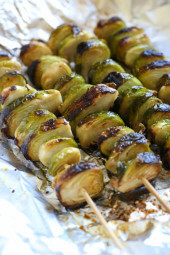 So yummy and so fast and easy!! I prefer sliced avocado to mashed because I like the slightly firmer texture. Also, if it’s a large avocado, I’ll do half and then spray the unused side with olive oil Pam, wrap and save. That works well to keep it from browning. I spread the half avocado (or if a very small avocado, I use the whole thing) across the plate in slices, use an over-easy egg that’s nice and runny, salt and pepper the whole thing. Then here’s my secret extra-yummy ingredient: on the whole wheat toast, I’ll spread a very thin layer of a “smoky bacon flavored” mayo that I found in a store. If you’re using butter or margarine on the toast, it’s an even swap. A bit more calories than the stated recipe, but OMG incredibly delicious! With a bacony flavor without all the calories of the actual bacon. Yum! I use a of SaraLee 45 calorie bread. I poach the egg. 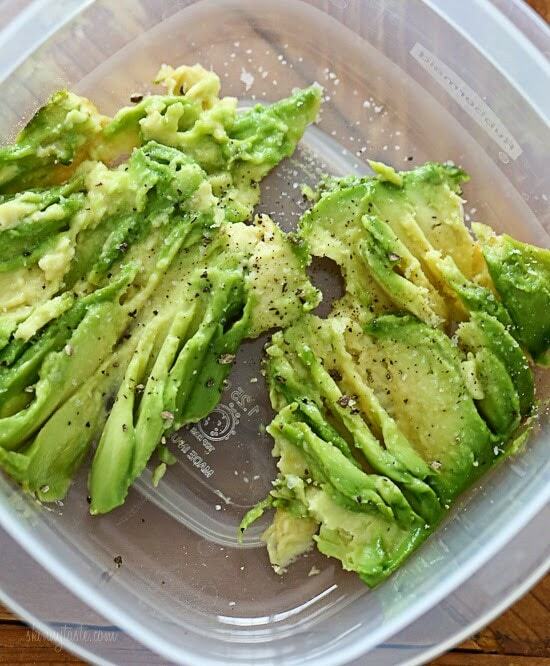 Use 1/4 of an avocado sliced. 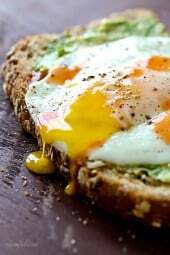 Put the avocado slices on the toast, top them with the egg, then sprinkle fresh dill on top. Add a few flakes of red pepper flakes too when I want some zing. Made this as suggested and it is so delicious! Found my new go-to breakfast! Give it a try, you will not be disappointed. When I cook my egg(s) I:1. pre-heat the pan2. spray with Pam3. crack 1-2 eggs4. 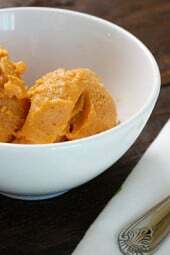 add 2-4 tablespoons water5. put on tight fitting lid6. let cook for 40-45 seconds on medium heat, remove lid and slide eggs onto a plate, YUM!Best way to cook eggs with no added calories! I’ve made a version of the avocado toast topped with blue crab meat and sliced shallots on top. How do you cook your sunny side egg in a way that it comes out looking so perfect? If my heat is too low, my egg runs too thin. Do I need a smaller pan, or am I just not getting the temperature quite right yet? I don’t usually cover my pan, I flip the egg. Does covering prevent you from having to flip? If so, how long do you keep it covered? Small pan (sprayed) low heat, covered, no flip. Kim, you are thinking of an, over easy egg. You don’t have to flip a sunny side up egg. 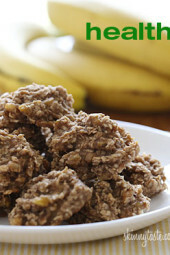 I love this simple but really yummy breakfast! Actually, I’ve also enjoyed it for a quick dinner. The creaminess of the avocado with the fried egg is just dreamy! I add just a few fried shallots and it puts it over the top! I have this nearly everyday….except I use Naan bread !! It is so good! I’d never prepared a “fried egg” in this manner until yesterday. WOW!!! It was perfect. And I’ve been cooking for 50+ years. I use a vacuum machine to extend the life of an avocado.. Instead of salt, have you tried crystalized citric acid (Eastern European “sour salt”)? It keeps the avocado from browning. One of my favorite breakfasts but I like to top with crushed red pepper instead of hot sauce. I also like to spread harissa on the toast before the avocado. I don’t eat eggs, angry suggestion for a replacement?